Cauliflower is among the cruciferous vegetables, together with broccoli, kale, cabbage and collards. The average diameter of its compact head known as curd is six inches. 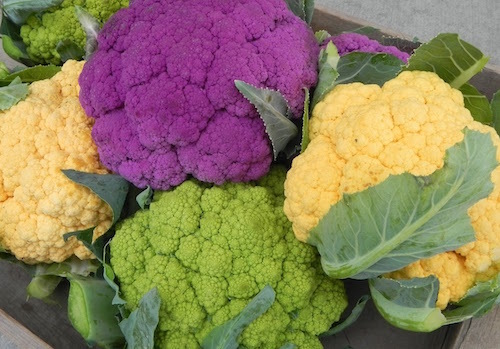 Another vegetable related to cauliflower is broccoflower (a cross between broccoli and cauliflower). A raw cauliflower has a firm but spongy texture and a slightly bitter flavor with a sulfurous hint. Its color is white in most varieties but there are others that are green and purple. Among the cruciferous vegetables, the white cauliflower is the least nutrient-dense of them all. The lack of color in this white flower vegetable is evidence of the lack of carotenoids or chlorophyll which are the common phytonutrients in most vegetables. Go for the colored variety if available. They are hybrids, not GMO and they’re certainly not dyed. 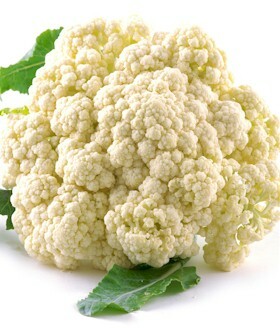 Even with the white cauliflower, however, it has its unique antioxidants and anti-inflammatory properties that help prevent various types of cancer. Anti-aging: The high amount of anti-oxidants found in cauliflower is essential in destroying free radicals that accelerate the signs of aging particularly in/on the skin. Arthritis: Certain compounds found in cauliflower have been shown to prevent chronic inflammation that leads to conditions such as arthritis and chronic pains. Bone health: The presence of boron in this white vegetable flower makes absorption of calcium and magnesium more effective for bone development and prevention of osteoporosis and arthritis. Cancer prevention: The high antioxidant content in cauliflower significantly neutralize toxins in our body, therefore preventing toxin-related damages that may increase the risk of cancer. Include cauliflower in your juicing recipes to get the most of these anti-oxidants. Cancer prevention for women: The indole-3-carbinol is a substance found in cauliflower that affects estrogen metabolism in the body, and prevents breast cancer and other cancers that primarily strike women’s reproduction system. Cardiovascular support: Vitamin C, K and some traces of omega-3 in cauliflower help prevent plaques forming in blood vessels and improve blood circulation. It is one of the best foods for supporting the cardiovascular system, useful for preventing heart diseases. Colon health: Cauliflower juice has anti-inflammatory and a calming effect that help prevent chronic inflammation that leads to certain bowel conditions. When eaten, its dietary fiber is important for normal bowel work and protects the colon from cancer-causing damage. Common cold and flu: The high content of vitamin C makes cauliflower an ideal vegetables for colds. Drink the juice regularly to improve your immune system. Crohn’s disease: One of the miracle phytonutrients known as glucosinolates can be converted to isothiocyanate molecule that prevents inflammatory responses for Crohn’s disease, when its juice is consumed at an early stage. Diabetes mellitus: With the various medicinal properties, the low carbohydrate content and low glycemic index, cauliflower is a suitable and healing food for diabetics. Digestive system: The amino acid glutamine in cauliflower juice is very gentle and calming on the digestive system, detoxifying, repairing ulcers, healing and regenerating. For therapeutic purpose, take this juice in small amounts three times a day on an empty stomach. Mix with some carrot and celery juice if the taste is unpalatable for you. Peptic ulcer: The sulforaphane that cauliflower contains helps in protecting the stomach lining from bacterial growth, such as the Helicobacter pylori. Pregnancy support: Cauliflower is high in folate (vitamin B9) which helps in fetal development. Before and during pregnancy, folate prevents the occurrence of neurological defects, such as spina bifida, in the fetus. Weight loss: Cauliflower is a great food to be included in a weight loss diet because it is low in calories. The nutrition also helps to satisfy the appetite, reducing the cravings of wanting to eat more. When buying cauliflower pick those that are clean, creamy white in color (if the white variety), has compact and firm curd with the buds still intact and not separated. Reject the spotted or dull-colored ones. For fresher supply, choose those with thick green leaves as the leaves help protect the curd. Since the size is insignificant with quality you can choose whatever size that fit your needs. Store raw cauliflower in paper or plastic bag and refrigerate for it to stay fresh for up to a week. Position the cauliflower with the stem side down to prevent moisture from forming in the floret clusters. In case you bought pre-cut cauliflower florets it is best to consume them within a couple of days at most because they start losing their freshness from the time they were cut. The easiest way to acquire all the vitamins and minerals that is found in this vegetable is by juicing it. Cauliflower juice is easier to drink compared to the other members of the cruciferous family. Mix the juice with carrots and green apples for a great tasting juice. Cauliflower has a natural occurring substance known as purine. When purine is broken down, it forms into uric acid so an excessive intake of purine can lead to an increased level of uric acid in the body. Though purine is commonly found in human, there are individuals who have purine-related problems like gout or kidney stones formation. It is advisable for them to limit intake of cauliflower. Cauliflower, when mashed or juiced may give out an odor like it’s turned bad, but it is just its natural smell and nothing to be worried about if you know that you were using a fresh flower.